It seems chives are everywhere. Years ago, I bought a pot of chives and since then they’ve travelled with me from home to home. While I’ve managed to kill most perennials, the chives are persistent. They never let me down and I know I can count on them every spring to bloom and flourish through the summer. They’ve even started to spread into other parts of the garden, which I don’t mind. The chive blossom is a beautiful purple flower that adds great colour to the landscape. When those flowers begin to bloom, I pick them and dry them out to add to salads. They add a wonderful hint of colour. This year, we made chive blossom vinegar. It’s so easy to make and great to have in the pantry for use in a vinaigrette or any cooking and baking where you want a mild onion flavour added to the dish. Take the freshly picked blossoms and submerse them in water. I leave them in there for about an hour and swirl them around to get rid of any dirt or pests. Remove them from the water and thoroughly dry them. You can use a salad spinner or place the blossoms on a a baking sheet lined with parchment paper and into an oven to dry out. 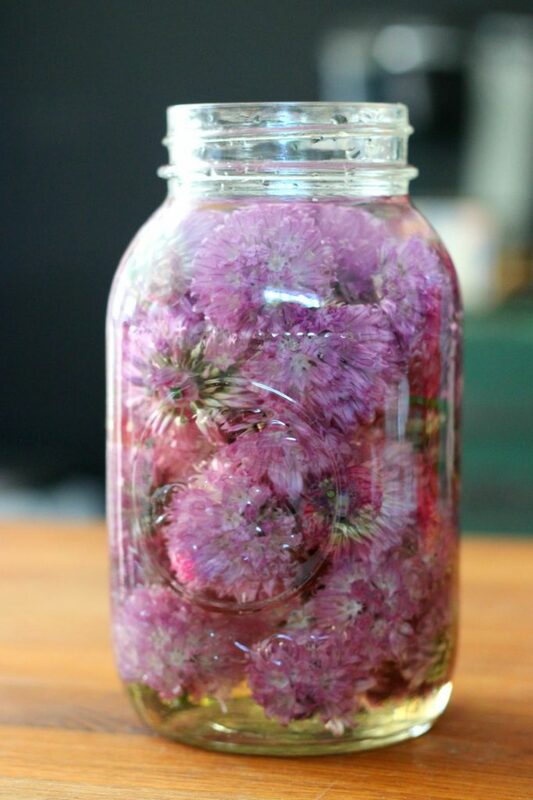 Fill the mason jar about 3/4 of the way with the chive blossoms. Top with vinegar. Secure with a lid and store in a cool dark place for about 2 weeks. Strain the liquid into a clean bottle. Toss the blossoms. The vinegar turns into a beautiful light purple colour. If a litre of vinegar is too much for you to use, you can certainly adjust the amount being made or split it out into smaller jars and share with friends!